If we’re honest with ourselves, in trout fishing, reels primarily function as line holders. 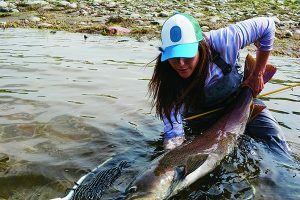 The reels contain the unused line during casting, but many trout anglers typically strip-in by hand upwards of 60 percent of the fish they catch rather than ‘put them on the reel.’ But when a fish is caught on the reel, it’s important that the reel performs as needed and without fail. 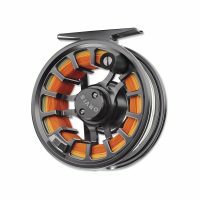 The current crop of reels designed for trout anglers includes some exceptional products. Notably, our Best in Class winner – the new Sage Spectrum – offers an exceptional blend of performance, durability, and value. We used these reels on a variety of trout rods (see 2018 Trout Rod review package). The test team included men and women who work and play in trout waters on a regular basis like fishing guides from Washington, Idaho, and Montana, a retired game warden, a handful of volunteers with Trout Unlimited, and members of the Women Fly Fishers of Washington. In the past, we made efforts to cover a variety of water and conditions with each reel, but this year, we made certain each model was used in still water and in rivers. We also ensured each reel was used while fishing dry flies of different sizes, nymphs, and streamers. We threw both floating lines, and sink-tip lines with every reel. 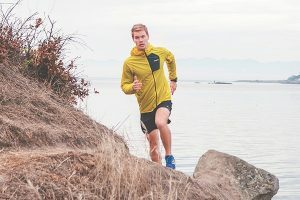 The Sage Spectrum earned near perfect marks from myself and the review team after exhaustive testing in a variety of conditions and situations. I found the Spectrum a wonderfully reliable tool, no matter how badly I treated it. Dunked into murky sand-filled waters? No problem. Dropped over a bridge on concrete below? Still works perfectly with hardly a scratch. Booted around the bottom of the boat for a day or so? Drag was still perfectly tuned for smooth operation. 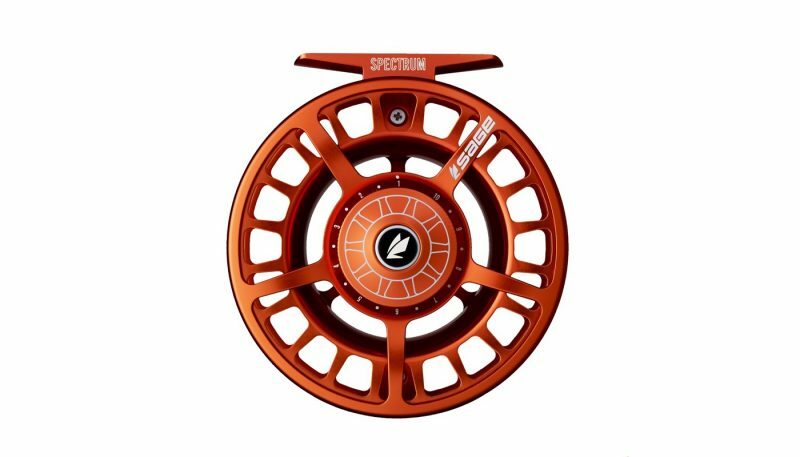 The Spectrum is the lightest reel in this class, with the second-biggest arbor size. 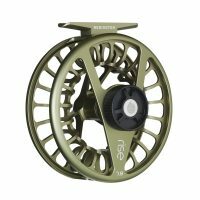 I couldn’t find a better reel this season, and my team of testers unanimously agreed – it is the Best in Class Trout Reel for 2018. The Redington i.D. reel provides good functionality with a unique flair for fashion thanks to its customizable nature. The smooth, blank face of the i.D. accepts preprinted vinyl decals so users can highlight their own personality with their reel design. Though that fashionable design capability of the reel gets the most attention, the reel’s performance is worth noting as well. While it is a tad heavy compared to others in the class, the i.D. offers good line management at an affordable price. It is rare for a product to excel in all aspects of its design, but that makes the success of Sage Spectrum even more impressive. 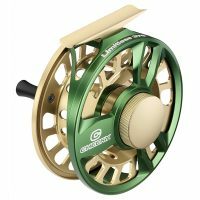 This reel is light, wonderfully functional, and incredibly durable. The Spectrum absorbed a ton of unintended abuse and never slowed down. It proved remarkably function, even when blasted by sand-laden windstorms or after being dunked in grimy ditch water. The fact that it falls well within the mid-price range makes it even more impressive. 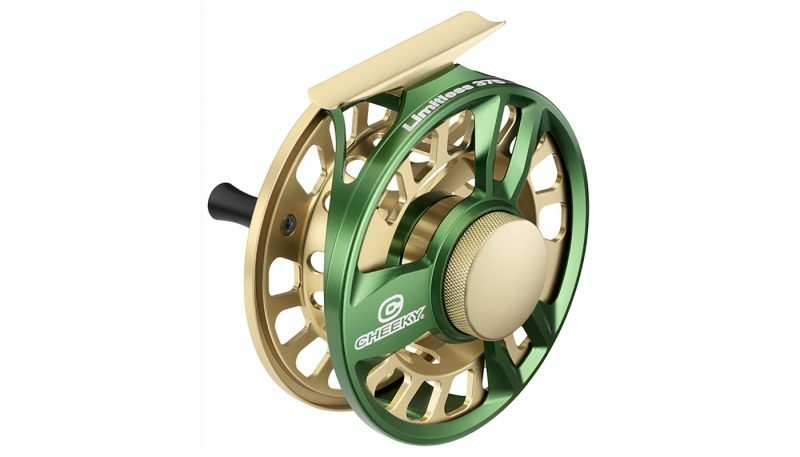 The Sage Spectrum has the lowest weight in this class – a full 33 percent lighter than the heaviest reel in the category (the Cheeky Limitless). The Redington Rise is only slightly heavier, both balanced well on the rods during testing. The weight difference between the heaviest and lightest reels was only a few ounces, but after long days of endless casting, that can really add up and lead to increased arm fatigue, which affects casting performance. 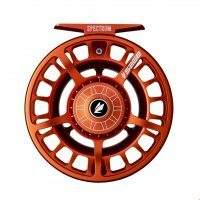 The Cheeky Limitless sports the largest diameter spool, and it picked up line faster than the rest of the models – pulling in more than 11 inches of line with each rotation of the spool. But the Best in Class winner, the Sage Spectrum, was just 1/8 inch smaller in diameter. On top of that, the Spectrum sports a huge easy-to-access drag control knob for fast, easy operation. The Spectrum also offers the easiest means of converting the reel from left-hand to right-hand retrieval (or vice-versa). The other reels can be converted but with varying levels of difficulty. The rest of this class also employ large arbors, with the smallest – the Redington i.D. and the Orvis Hydros SL – standing at 3.5 inches versus the Cheeky’s 3.75 inches. 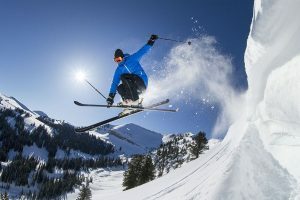 Measuring durability can be problematic since during real-world usage can’t always be duplicated in testing situations. In actual real-world use, products face not just normal wear-and-tear but also random exceptional events. When testing this class of reels, we had a few such events of note that added to our durability valuations. While fishing in Idaho, a tester dropped the Sage Spectrum off a bridge abutment onto a concrete boat launch some 20 feet below. The Spectrum was essential unharmed by that fall – a few scratches but no structural damage was recorded, and no loss of functionality or performance. In contrast, the Redington i.D. suffered damage from a much smaller fall. Redington constructs the i.D. by die-casting the aluminum components rather than machining them from aluminum stock. Casting – pouring molten metal into forms – is a cheaper alternative to machining, or cutting, the parts of solid aluminum blanks. But when the Redington i.D. was dropped into rocks while wade-fishing a remote river, a small bit of the cast aluminum frame broke away. The reel was still functional, but that chipped section had to be filed smooth to prevent its sharp edge from catching the line. In terms of normal wear-and-tear, the Sage reel also excelled – the sealed drag proved impervious to grit and debris, and the clean design allowed fast rinsing and cleaning when the reel did get dirty. The Orvis Hydros and Cheeky Limitless also drew rave reviews for their durable construction and flawless performance after rugged use. The Cheeky Limitless earned accolades for its unique integrated reel foot design, which proved very strong and durable. Cheeky designers integrated the reel foot into the reel body – the foot is machined out of the same aluminum stock as the body – for added strength and stability, and that design works perfectly. The Spectrum’s sealed carbon drag system proved to be very effective. The large control knob was easy to adjust with a simple push of a finger, and I liked the numbered scale so I could easily lock in on a remembered previous setting. Orvis’ drag system also performed exceptionally well, though opinions varied greatly on the control of that drag system. The asymmetric control knob – it features a large cut-out on one side – was loved by some (including me) as the cut-off gave us a sense of the drag setting without looking. But a couple testers felt it was awkward to handle. 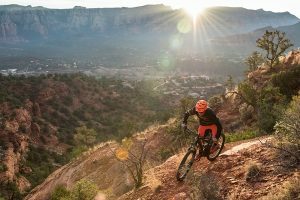 The Redington Rise drag was perhaps closest to the Sage’s exceptional performance. Like the Sage, the Rise features a large control knob that can be shifted with a single finger when you need to tighten or loosen line tension while playing fish. The Redington system is sealed as well, ensuring performance isn’t hampered when it gets dirty. The lower-priced Redington i.D., was the least efficient in this class, and was the only one that seemed susceptible to being impacted by grit. The Redington i.D. takes the cake when it comes to unique appeal in design. 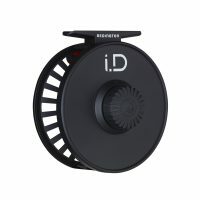 This simple reel features a flat, black faceplate that can accept vinyl decals. Redington offers a host of decal options, from fish prints to state flags, to social icons, allowing users to customize their reel. The decals can be removed and replaced easily should the user want to change their look during the life of the i.D. 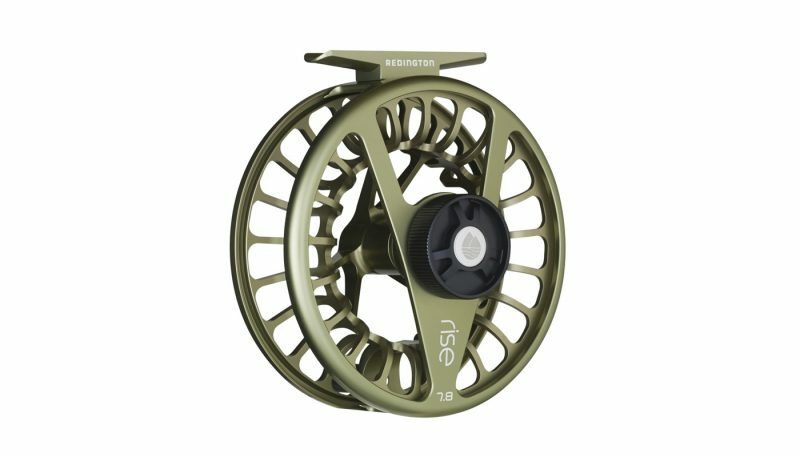 The Redington Rise and Sage Spectrum offers anglers modern styling in simple colors, while the Orvis and Cheeky reels present more classic designs that appeal to traditionalists. For this test, I was joined by trout guides, game wardens, outdoor photographers, and fish advocates from Trout Unlimited in evaluating the reels. Each tester used the reels for several days in a variety of conditions – usually while simultaneously testing rods. When possible, multiple testers ventured out together for side-by-side comparisons and discussions. At other times, we each carried two or more reel/rods to the rivers and lakes to fish the products back-to-back in identical conditions for stronger comparisons. Proving that everyone is different, we all had our own likes and dislikes, but the strengths – and weaknesses – of each reel revealed themselves to each of us over the course of the tests. What is a Trout Reel? 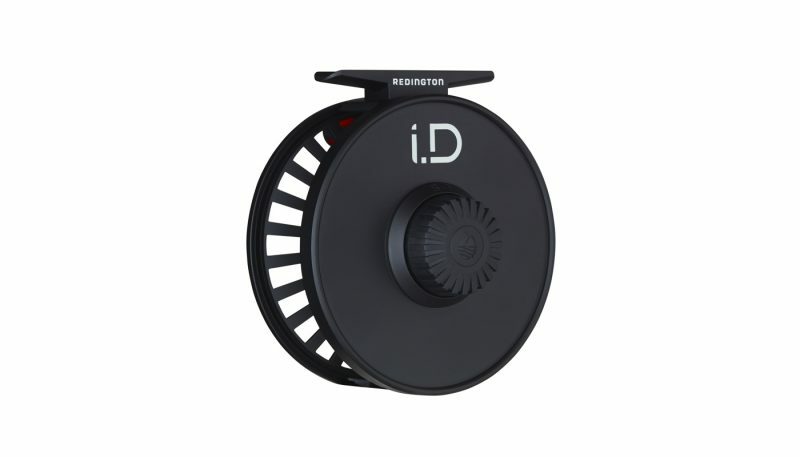 We have broken fly reel coverage into two core categories: Fly Reels for Trout Fishing and Specialty Fly Reels. Specialty reels include an array of products, from simple click-and-pawl dry fly reels to heavy geared reels needed to hauling in deep-diving ocean fish. 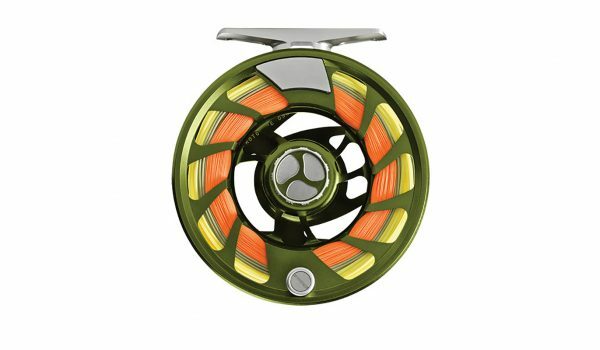 These reels tend to have unique designs focused on addressing specific fishing situations. Trout fishing reels, meanwhile, tend to be general purpose reels suitable for the host of freshwater fishing conditions in which trout are found. For many trout fishing situations, when a fish is hooked, you’re more likely to simply strip line in rather than crank it in with the reel. But that’s not always the case, and when you do get a fish “on the reel,” it’s important that it performs as needed without fail. As a line tender, reels must hold not only the fly line appropriate for your rod, but also enough backing – non-casting line attached to the back-end of your fly line. Backing serves a couple purposes. First and foremost, it gives anglers the security of having enough line length to let fish run if they big and strong enough to break your thin tippet material. Letting a powerful fish run lets you tire it out enough that you can reel it in without breaking off. 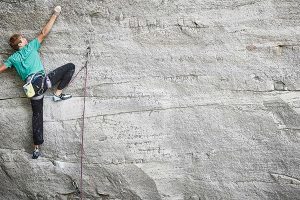 Having the extra reach provided by the backing comes into play not just with big, strong fish, but also when the fish are diving in deep water, or running downstream in strong currents. Backing also gives a bit of extra girth to your reel’s arbor, allowing you to pick-up line faster than if it was wound directly onto the reel arbor. Your reel should typically hold 70-100 yards of backing, with room enough for the line to fill the spool the rest of the way without pinching. 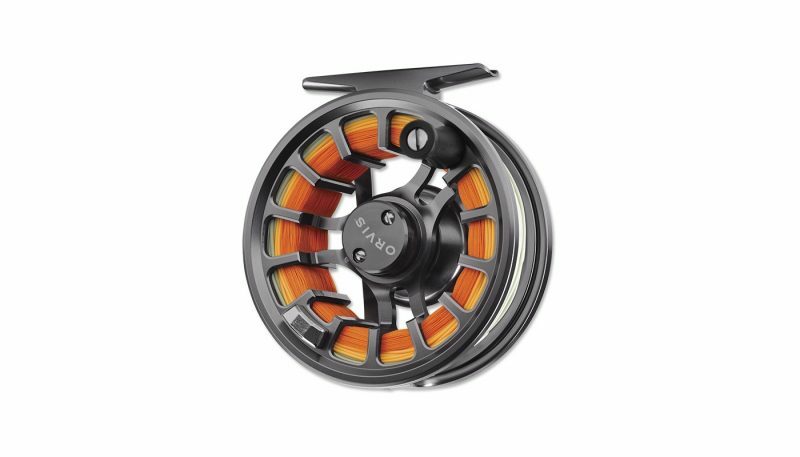 Modern reels have four main components: feet, body, drag system, and spool. Today, reels typically have uniformly sized mounting feet so they’ll function with any rod of suitable line weight. The mounting foot is attached to the reel body either through a direct solder or with two or more screws. The reel body provides the framework of the reel and holds the other components in place. The drag system controls the friction placed on the spool line as its played out. That is, the drag system allows anglers to control how much more effort is needed to pull line off the reel. The drag system can be included on the body or the spool itself, and is a generally controlled by means of a tightening knob. The spool slides onto the center axle of the reel body, and it simply holds the backing and line. Many reel models allow fast removal and replacement of the spool, giving anglers the option of having different types of line spooled up and ready to use on the reel. 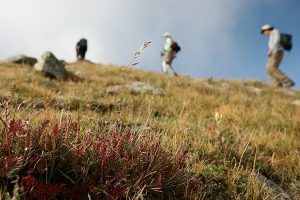 In this way, anglers can fish nymphs deep in a river during the afternoon, but switch over to the floating line for dry fly fishing when the evening mayfly hatch occurs.